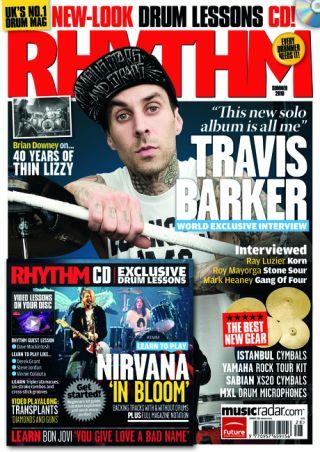 Missed out on last month's awesome Travis Barker Rhythm cover feature? Don't fret because we've got a special copy signed by the Blink-182 drummer to give away. We caught up with Travis over the weekend as Blink prepared to take to the stage for their killer headlining slot at Reading Festival. All you have to do to put yourself in with a chance of winning the signed mag is send an email to Rhythm@futurenet.com before 17:00 Monday 6 September. We'll then draw a winner at random from the entries. Good luck! You can still get your hands on a copy of the issue by heading to www.myfavouritemagazines.co.uk.